WELCOME TO THE WAMLE WEBSITE, YOUR HOME FOR ALL THINGS "IN THE MIDDLE!" WE ENCOURAGE YOU TO EXPLORE AND SHARE RESOURCES. FOLLOW US ON FACEBOOK, TWITTER, PINTEREST, LEARNIST, AND HERE ON THE WEBSITE FOR MIDDLE LEVEL RESOURCES! 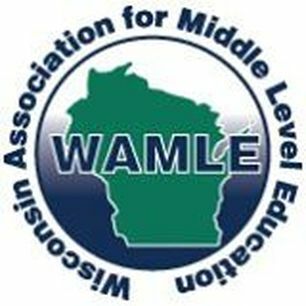 THE WISCONSIN ASSOCIATION FOR MIDDLE LEVEL EDUCATION, INC. ​IS DEDICATED TO PROMOTING THE EDUCATIONAL EXPERIENCES OF MIDDLE LEVEL LEARNERS BY PROVIDING VISION, KNOWLEDGE, AND RESOURCES TO ALL WHO SERVE THEM IN ORDER TO FOSTER THE DEVELOPMENT OF LIFELONG LEARNERS, CARING INDIVIDUALS, AND RESPONSIBLE CITIZENS. Happy Middle Level Education Month! The World of 7 Billion student video contest is back and accepting submissions! The contest makes for a compelling class project by using current issues that impact us all. It’s open to all middle and high school students, with cash prizes and free teacher resources! New topics for the 2018-19 school year have been announced, so check out the website now! You can now make a charitable donation to WAMLE! ​Visit our membership page for more information. Are you doing something exciting at the middle level? Do you have resources or insight to share with middle level educators? We would love to feature you on our site. ​Tell us about it on our contact form. The Wisconsin Association for Middle Level Education, Inc. is dedicated to promoting the educational experiences of middle level learners by providing vision, knowledge, and resources to all who serve them in order to foster the development of lifelong learners, caring individuals, and responsible citizens.